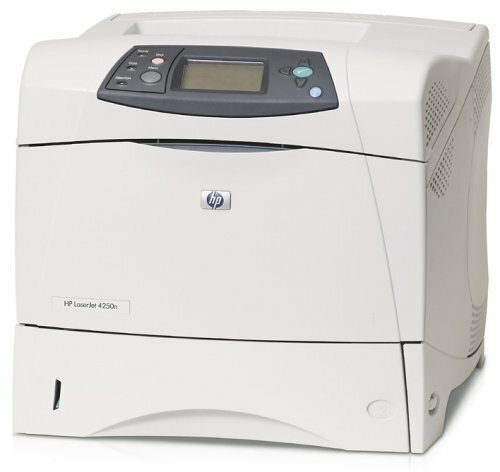 Have you been looking for a dependable laser printer like the HP Laserjet 4250n to support your business? Perfect, then there is no need to search any further! With the largest selection of new or used Hewlett Packard printers in the industry, Arizona Copiers is your number one resource for fulfilling all your growing business’ needs. When you select to purchase, rent, or lease this high-quality printer from our leading company, you will take pride in receiving exceptional customer service and speedy delivery to any of our service areas in the Valley of the Sun. Please contact us at 602-428-5885 for an affordable quote today. The HP Laserjet 4250n delivers one of the fastest speeds for laser color printers on the market today, producing more than 43 pages every minute. After it prints the first page, the powerhouse machine increases its speed for all succeeding pages and completes your business projects in record time. The LaserJet 4250n is renowned for its speed and dependability, mostly because of the document feeder that can hold a maximum of 600 sheets at a time. In other words, the printer has a larger capacity in comparison to most of the other printers of its kind. When you purchase this Hewlett Packard model from the Arizona Copier company, you are awarded with tremendous built-in networking capabilities. For more demanding business networks, the onboard RAM on the printer comes with a full capacity of up to 512MB. The printer is also compatible with all Mac, PC, Unix, and Sun operating systems, as well as Compact Flash Type l and EIO Slot. Therefore, your business will enjoy seamless transfer of data from all of the computers used throughout your workforce for printing made easy. Furthermore, the HP Laserjet 4250n comes with endless options to customize to your business’ needs and preferences. It is simple to install a duplexer unit onto the back of the machine. The printer will automatically locate the duplexer and add duplexing as an option for your next large printing endeavor. Since it is able to print on both sides, you will dramatically reduce paper use. You may also wish to add an optional stapler feature for creating bound copies for smaller print jobs. This Hewlett Packard model easily processes varying kinds of paper, including color paper, cards, envelopes, bond paper, transparencies, recycled paper, and other forms of printable media. Get Your Own HP Laserjet 4250n Today! At Arizona Copier, we pride ourselves in offering the most inexpensive discounted prices in the state to accommodate your business’ budget. Whatever configuration or customizations you need, we will work with you to find the best possible solution. In addition, we provide incomparable warranties on all of our products to protect the value of your investment properly. Our locally owned and operated company looks forward to working with you and demonstrating our dedication for customer satisfaction. Please call us immediately at 602-428-5885 to start the process of buying, renting, or leasing your own HP Laserjet 4250n today!